W ould you pay more money for less product in return? Most likely, you would say no; but the executives and marketing people at the world headquarters of Coca-Cola are betting otherwise — and they are winning that bet. The smaller can of 7.5 ounces represents approximately 30 percent less product in volume than the typical larger can of 12 ounces. A larger can of Sprite typically sells at an average of 31 cents per can. 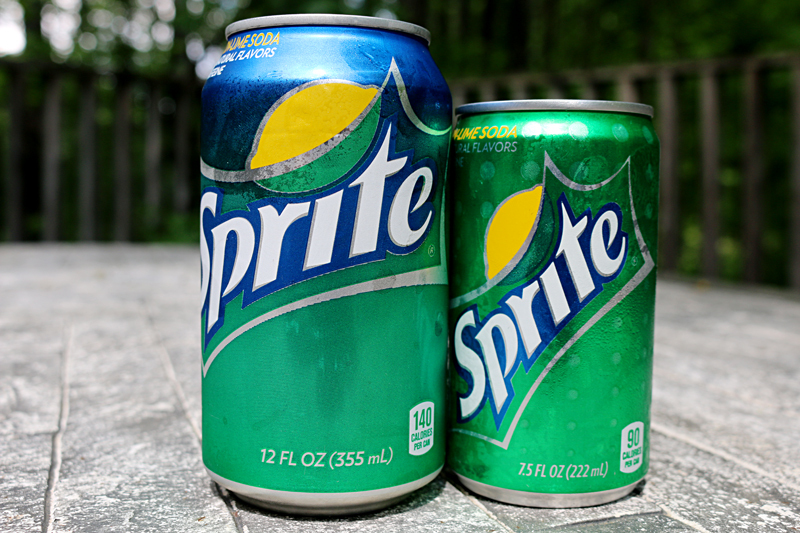 Compare that to the smaller can, which sells at an average of 50 cents per can — and these smaller cans are driving revenue, as they appeal to “people who want to drink less soda for health or weight reasons.” A photograph comparing the two cans of Sprite is shown at the top of this article. Could Smaller Cans Affect You When Traveling? Obviously, this question is moot if you do not drink carbonated beverages; but if you enjoy one during a flight, could the airlines possibly give you less soda from 7.5 ounce cans? Unless you say something, flight attendants will automatically fill your cup up with ice before pouring you a drink. It is not necessarily because they care about ensuring that you have as cold a beverage as possible; but ice is usually less expensive than beverages — and it allows the beverages to go further, potentially saving the airline money. You can usually receive a full can of a beverage simply by asking for it; but what if that can happens to be the 7.5 ounce can instead of the typical can of 12 ounces? After already paying $16.00 extra for access to a lounge at a hotel property — with cans of carbonated beverages as one of the very few offerings — how do you think Keri Anderson of Heels First Travel would feel about 7.5 ounce cans being offered in that lounge instead of 12 ounce cans? “It turns out consumers are willing to pay more per ounce for convenience and portion control,” according to the aforementioned article. What a marketing gimmick. That is almost as good as the declaration designed to sound euphemistic to consumers of yogurt sold by a major company: there was now more room to mix your favorite toppings in your favorite flavor of yogurt. I shake my head when I read that the answer to curbing obesity, tooth decay and poor health is to mandate smaller portions of product sold at the same — or higher — price. Are people really that out of control that they cannot portion what they want to eat or drink for themselves? I enjoy consuming soft drinks; but I typically prefer to do that only at lunch or dinner time — although occasionally I will consume some soda when it is not time for a meal. I drink either water or juice at other times whenever I am thirsty. The problem for me is that I prefer to purchase the two-liter bottles of soda, as they give the best value — I can get them on sale for as low as 89 cents per bottle if I purchase name-brand products and as low as 50 cents per bottle for the generic or store brand — but I can never drink enough soda before the fizz escapes and the soda goes flat. My message to all companies — not just those who manufacture carbonated beverages — and municipal governments is stop with the reducing of volume in the products you sell. Do not penalize me just because some other people have less control of themselves. Rather, offer a variety of sizes at whatever price points you believe are fair; and allow me to decide what I want to purchase and what I believe is best for me. At left is a glass bottle which can hold ten ounces of soda; while on the right is an aluminum bottle which can hold 8.5 ounces of soda. Photograph ©2016 by Brian Cohen. For reading the article this far, you get a small bonus Stupid Tip of the Day from me: I usually get small bottles of soda with caps that screw on free of charge at events; and I will usually take a bottle of partially-consumed product for the ride home. …and although I do not watch my calories or am not on any diet, this practice does encourage portion control. The nice part is that if I am only in the mood for a few gulps of soda — perhaps an ounce or two — I can reseal the smaller bottle and the soda will still remain fizzy enough for the next time. Even though plastic will suffice, use glass or aluminum bottles for best results — such as the ones shown in the photograph. They help to keep the cold and the fizz in the soda longer; and if I use the 8.5 ounce aluminum bottle, for example, I can get almost eight servings of soda at slightly greater than eleven cents per serving…. …and there you have it, as I get the best of both worlds: smaller portions of soda whose fizz is kept longer — and at a very inexpensive price. I actually have tried to not drink soda at all in general. The whole soda debate is a red herring. You shouldn’t be drinking them to begin with. So I guess NYC and Bloomberg won’t like this trend with the 3 cent per ounce tax they propose as a so called effort to try and curb obesity. First at 7.5 ounces the tax would be an uneven 22.5 cent tax per can as I’m sure they wouldn’t round up. This is compared to 36 cents per 12 ounce can or $1.92 per 64 ounce big gulp. Soon enough they will be outlawing the small cans and keeping a 20 ounce minimum size. I don’t drink much soda or coffee but neither is very healthy of course. As science clearly shows, when it comes to achieving or maintaining a healthy weight, balancing all calories with physical activity is important. That’s precisely why our industry launched the Balance Calories Initiative in partnership with the Alliance for a Healthier Generation. Via this effort our member companies have voluntarily pledged to work together to reduce beverage calories per person by 20 percent by 2025. To achieve this goal we are rolling out low- and no-calorie options and making these choices available in smaller portion sizes. This effort is also broadly working to promote a healthier overall balance between what people eat, drink and do. We contend that, through comprehensive education and collaboration, meaningful health behavior change will continue to take root across America. Trying to make America less great at a higher price, are we ? Obviously profit motivated at the expense of the consumer, in my opinion. I’m not buying it. You’re losing a loyal customer.